Dr. Richard Langford holds bachelor of science in zoology and received his degree in veterinary medicine from the University of Florida School of Veterinary Medicine in 1989. Dr. Langford did his externship in marine mammal medicine at the Mystic Aquarium in Mystic, Connecticut. He then attended Ohio State University taking courses in orthopedic surgery. After completing his studies, Dr. Langford practiced in veterinary hospitals in north-east Florida. In 1994, he opened Coral Reef Animal Hospital in Jacksonville Beach. In March of 2009, he moved his practice to a newly built state-of-the-art facility in Atlantic Beach. Dr. Langford served in the US Army during the Vietnam War, he is the son of Andrew and Virginia Langford, his Father was an Air Force Officer, veteran of WWII, Korea and Vietnam. Dr. Langford’s personal interests parallel his career. He has traveled to Africa, Asia, Europe, Latin America and North America to study and photograph animals in their natural habitats. Dr. Langford’s love of animals continues at home where he and his wife live with eight rescued cats: Blackie, Mellow, Pooper, Fatty, Elvis, Pretty, Spotty, Dusty and Poogie, their Yorkshire Terrier tea-cup. Why you are interested in the veterinary field? I love working with animals and always knew it would be something I would do in my life. Though the job can be emotionally hard, it is always worth it at the end of the day. Tell us about your pets. I have three dogs; a hound mixed named Riley, a staffordshire terrier named Emma, and a boxer mix named Xander. I also have several cats, and care for a feral cat colony that lives on my street. Why do you love Coral Reef Animal Hospital and Dr. Langford. Coral Reef has become a second home to me and the staff a second family. Though we are all very different people we have come together over our love of animals, and have created one the best teams I think anyone could ask for. Dr. Langford is possibly the most intelligent and interesting person that I have ever had the pleasure to meet. He is one of my absolute favorite people all around, whether it is as a veterinarian, a boss, a mentor or a friend. I could not imagine what life would be like without him! Personal Touch : In my spare time I’m usually hiking, backpacking, camping, or somewhere in the woods. Otherwise, I enjoy reading, gardening, music, and writing. Why are you interested in the veterinary Field? I have always loved animals and working here has allowed me to help care for them. Tell us about your pets. I have a 6 year old cat named Bogart that my mom and I adopted. He is sweet but very shy around strangers. 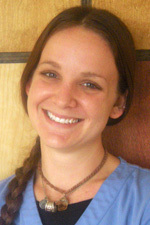 Why do you love Coral Reef Animal Hospital and Dr. Langford? Everyone here truly cares about the animals we treat. Dr. Langford is great with his patients and is full of information. We are a family here and you do not find that at every job. Plans for the future: I don’t have any plans set for the future. I have recently graduated from college and I am currently enjoying this phase of my life. Hopefully traveling to different parts of the world is in my future. Personal Touches: In my free time I enjoy spending time with my family and friends, listening to music and watching a good movie. I also like going to the beach, whether it is enjoying heat in the summer or cold in the winter. Why are you interested in the veterinary field? Ever since I was a kid, I always knew that I wanted to work with animals. I would try to bring home stray cat from around the neighborhood and always be the one to catch the loose dogs and try to return them to their owners. Being with animals always put a smile on my face no matter what it was. Tell us about your pets. I currently have a 12 year old black lab mix named Kanye that enjoys most of his day sleeping. Why do you love Coral Reef Animal Hospital and Dr. Langford? This place is just all around fantastic. The staff is knowledgeable of everything around the hospital and are always helping each other out. I started here without any knowledge of anything and in less than a year, I have learned so much from everyone. Dr. Langford is extremely knowledgeable of his field, and always has the best interest of the animals and their owners in mind. Plans for the future: I am currently working on my AB and plan to eventually get a bachelors degree in animal behavior. 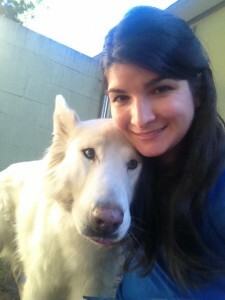 My ultimate dream is to eventually train dogs to help people. Personal touch: I have lived in Jacksonville for 17 years and in my free time I enjoy traveling, going to concerts with the local music scene, and enjoying the outdoors. Why are you interested in the veterinary field? I love all animals. I feel that in return for their companionship, and trust, we are all have an obligation to protect and care for them. My wife and I currently have one Cat; Calypso, she is the strangest, most loving cat I have ever had the pleasure of getting to know. She enjoys waking me up each morning to remind me that she has not yet had her breakfast. Why do you love Coral Reef Animal Hospital and Dr. Langford? I am always excited to come into the animal hospital to meet all the new animals and to visit all of the animals I have already become friends with. In addition, I enjoy working with the Coral Reef staff as well as Dr. Langford, because, I can recognize in them the same respect and compassion towards animals that I have. I plan on continuing to enjoying life with my wife, my pets, and one day my children. The pets you have, if you don’t have any why not? I have one dog — Buddy, and one cat —Mannera. Why do you love Coral Reef Animal Hospital and Dr. L? I love working with everyone here. We have so much fun and Dr. Langford’s jokes are hilarious! Personal Touch: I like jogging at the beach with my dog, and being curled up on the couch with my cat and dog watching mystery movies. I also like going on long road trips. Plans for the future: I am finishing my BA degree, would like to get involved in the administration of an animal hospital so I can combine my knowledge as a Veterinarian Technician with the administrative details. And I still make room for trips !